Sleepezy pillows are an adjustable pillow which feature separate chambers for the filling, separated by sealed inner walls, ensuring that the pillow retains its shape, supports the neck and cradles the head. The contour of the pillows provides anatomically correct support for your head and neck which improves your sleeping postures and can reduce stiffness, neck, head and back pain and may even minimise light snoring. The filling is a polyfill and can be adjusted for optimum comfort. 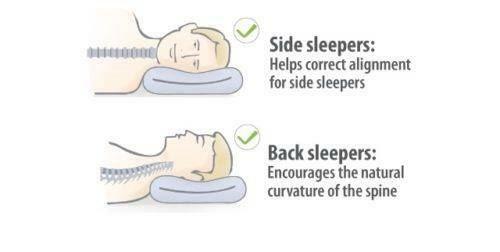 This means that you can tailor the height of the pillow for your body shape, keeping your neck in a neutral posture. Sleepezy pillows are available in 2 or 3 zone construction and fit any standard pillowcases. Sleepezy Pillows are made right here in South Australia and are available for purchase at any of Core Physios Adelaide locations.